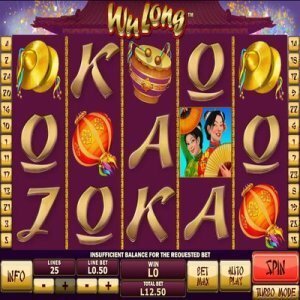 [miau] The Wu Long Slot machine game is based on traditional Chinese customs, and you can see at the very beginning of the game that a Dragon is shown. This is a traditional Dragon that is used in celebrations, when many people gather underneath it, to tote it throughout the streets. There is a drum beat playing in the background, and you can see some traditional Chinese symbols, such as Chinese women, the Dragon, drums, as well as letters that are written in a calligraphy type manner. This is a five-reel game with 25 pay lines. Your minimum amount can be one penny, or you can choose to play up to, an amazing $100 per line. Before playing, make sure to do your multiplication, because $100 per line, over 25 lines, is $2,500 for one bet. Although it’s a rarity for gamblers to bet this amount, it’s still completely up to you what you’d like to play. At the bottom of the screen are the “Bet Max” button, which can easily get you to your maximum bet amount. The Bet Max button is much easier than having to manually push the button each time you want to up your bet, until you reach the maximum amount. There is also an auto-play feature in this game, which allows you to choose your play, and it is also much easier than playing manually. If you’re anxious for the reels to quit spinning, quickly, you can turn Turbo Mode on, and it will quickly make the reels stop spinning, and to show your possible winning combination that much sooner. As far as the symbols go, the Dragon is the one you really want. If you happen to get a dragon, and it’s a winning combination, the screen will begin to move, and the Dragon goes across its symbol. If you get three or more of the dragons anywhere in the game, you win 12 free games, as well as multipliers. In this game, you can have multipliers from 1x’s up to 6x’s your bet. You can also win even more free games within the free games that you are playing, leading to an overall big win, depending on your combinations. While you’re playing the free game, if you get the Dragon anywhere in the free game, it will increase the multiplier amount. Receiving two or more of the dragons within the free game, will give you additional free games. Unlike many other games, the Dragon can substitute for every symbol in the game, making it easier for you to win, if you get the right combinations. This game has an incredible multiplier amount, which goes up to six times, and has the ability to re-trigger free games, while you’re in a free game. You’ll want to use the Turbo Mode feature when you play as well, for faster play.